Carnaby Hollows Bush Retreat is a newly built property (2017) and is named after the Carnaby Cockatoo. There are 2 self-contained apartments, each with its own ensuite. Each room features a queen bed and a sofa bed, fridge, microwave, toaster, tea and coffee making facilities and reverse cycle air conditioning. Carnaby Hollows is situated on 2.5 acres of bush land and only 2.5km from the freeway and 4km away the train station. 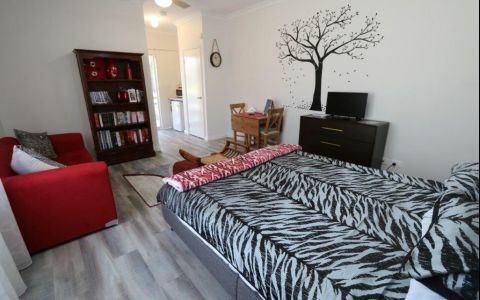 It is only 6km to Mandurah foreshore with shops, malls, cinema, performing arts centre, cruise boats and a choice of dining to suit all occasions. And Mandurah Forum has been renovated with a wide range of retailers, old and new. The outdoors is well featured in this beautiful holiday destination and is there for you to explore. Accommodation is to a maximum 4 adults per apartment. Continental Breakfast available for $15 per person, per day or Cooked English Style Breakfast for $20 per person, per day. Breakfast paid direct to the operator on arrival. Self contained room with ensuite. Each Room contains 1x Queen bed and Double Sofa bed. Continental Breakfast option is $15 per person, per night or Cooked English Style Breakfast $20 per person, per night. Breakfast paid direct to operator on arrival. No children under 12. Units are located on the end of the main residence, each with its own private access and free parking. Each unit sleeps up to 4 adults and is equipped with TV, fridge, microwave, kettle, toaster, reverse cycle air conditioning, stocked bookcase and own private en-suite. Outside each unit has its own patio with table and chairs. Everything is all brand new with lovely furnishings and very clean. My bed was comfy while the sofa bed for my son was a little hard but no biggie. We were spoilt rotten with Lindt chocs on arrival, a bowl of fruit, milk and selection of sachet coffees. Kitchenette came with microwave and plates, utensils, for a quick meal we bought from the local Woolies. Aircon and fan in the room with TV. Breakfast was amazing with a selection of croissants, doughnuts, muffins, toast, cereal, OJ, yoghurt, we just were so spoilt. Lovely bush setting. Thanks, Flo and Derek for your hospitality and wonderful space. You really have gone to a lot of trouble to make your guests welcome. First class! Thank you. The lovely rural setting, but just 5 minutes drive from town where there are many dining options. Fresh milk in the fridge, yeah! Bowl of fruit on arrival, with a lovely touch of Easter eggs as it was the Easter long weekend. Ample breakfast. Fresh décor and very clean. Enjoyed our stay and would stay again, plus recommend to others.